“Village” probably evokes a cluster of houses around a post office, country store, or perhaps a church, with a road right down the middle. Not so here. 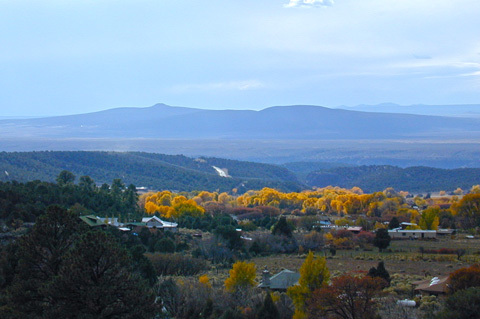 In northern New Mexico a village is a widely-spaced scattering of homes along a narrow mountain valley with water, trees, and arable land. In the old days, at least, property lines were drawn perpendicular to the valley, so that every family had a slice of pasture and the creek or mother ditch. If there’s anything resembling a center, it’s usually a social one like the post office, where people share news, gossip, and catch up with their neighbors. Nature has a wholly different quality up there once you leave the settlements and hike a little. I don’t just mean the bear in the yard or the elk trumpeting in the fall. It’s more like something you don’t argue with. It’s there and beautiful and it can kill you. (Beautifully, of course.) And the whole time, you’re sensing something huge and sacred. It lights up your DNA. Genetic memory of the deepest kind awakens. We are unspeakably old, you know. Once my wife and I took a short hike up the valley from our rented adobe cottage. We were walking through a meadow beside dense forest to our right when I spotted a fawn curled up in a nest of grass on the edge of the woods. We stood and stared in wonder from not ten feet away, yet the animal didn’t move. Then I realized how large it was, though still quite young—good Lord, an elk! That meant six hundred pounds of momma elk was very close, so we skedaddled. On our way back down the valley, the fawn was gone. Another time I sat out back after dark on an almost-warmish summer night enjoying the stars. The house bordered directly on the national forest, and I sat there facing the trees. At some point I realized that anything at all could come walking out of the darkness, and I felt a fear like I had never known. It also made me feel more human somehow. Like I was of the Earth. It has been a little more than a year now since I blew up my life in Arkansas. I am sure it was a mistake now, financially, but I feel such trepidation when I consider returning. I have no idea where I belong, if anywhere. I knew I had to leave, but also know that I have not actually arrived, yet. I may never. I know the feeling. 🙂 But a year isn’t nearly enough time in a new place. It’s taken me fourteen! That doesn’t mean you can’t go back or find another spot, but still. The main thing is to go easy on yourself. Nothing is a “mistake,” because we only do what we can do at any given moment. The person I was in ’99, for example, couldn’t have managed his life any other way. And look, here I am. We are all indigenous, but a place like Taos can uncover that primal indigenous reality. When I first came I went into deep immersion and almost forgot time and history. It was a great shock when I went back to Denver on visits and everything seemed alien. I even forgot how to get around in the place I’d lived my entire life. But this is why I came to this place. Now I’m better able to live in both worlds (one at a time) but that original experience was a true rebirth. You must know Tracy McCallum, a friend whose house I visited in San Christobal. Hi Stephen! Actually I don’t, although the name seems familiar to me.